Call (314) 241-7801 or email us! Plasma Cutting is another service proudly offered by United Specialty Alloys. It is a perfect tool for high volume cutting and its accuracy helps to make it a cost-effective option for customers. Plasma Cutting uses ionized gas at a high velocity to conduct electricity and create heat that ultimately melts your working material. Meanwhile, the gas (or plasma) blows this cut portion away from the material and leaves you with a clean line. Compared to Oxy Fuel Cutting, Plasma Cutting works on a greater variety of conductive metals, often providing cuts at a faster pace. 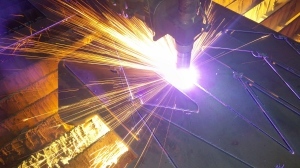 Since it does not work via oxidation, Plasma Cutting is able to be performed on materials that do not hold up to Oxy Fuel Cutting, such as aluminum and stainless steel. Plasma Cutting offers a competitive cost, especially on thick metal sheets and simple shapes that do not require detailing. It may have been used to produce some of the parts on your car or components of an airplane, in addition to signs or other everyday equipment. United Specialty Alloys is proud to offer Plasma Cutting to our customers in an array of industries across every business sector. Our facility houses a 10′ x 40′ CNC high definition plasma/ oxy fuel burning table, an 8′ x 20′ CNC under water plasma burning table, and our newest a 72″ x 144″ CNC plasma cutting machine with the new true hole technology. Copyright © 2019. United Specialty Alloys Co. All Rights Reserved.